Bill Eberle (Maine QIP principal) designed the data streams used by the NBA to package live information feeds for all live games. Multiple information packets were loaded and parsed by the NBA Courtside Live Flash application every 30 seconds. 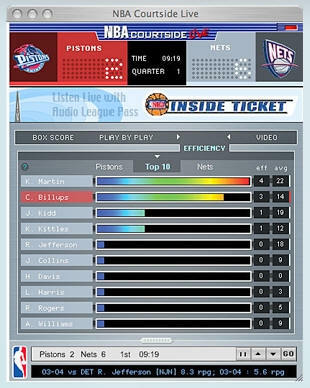 Bill also designed and created all Actionscript objects and methods and programmed all data processing and code based display functionality for the NBA Courtside Live application. The free Courtside Live application ran from NBA.com for 3 + years for all NBA and WNBA games (data collected live during game playtime was sent to NBA databases, packaged and made available to be read by the Flash application to show live game and player statistics in 3 panels with 15 sortable columns showing live player stats, a live commentary feed page, a dynamic player efficiency page based on a special efficiency formula created by the NBA, and a live video panel . . . here’s a link to the original Flash application (minus the live data) which will allow you to use all controls to get an idea of what this little application could do – “it was an amazing information application” (Bill). Scroll right and left to see the 3 panels of box scores. See related “Ideas” page. See Product Design Information page. To see what Courtside Live looks like today go to NBA Courtside Live page when scheduled games are in progress and click on one of the games. “Very nice . . . but the stat columns don’t sort” (Bill). A similar, simpler, dynamic information Flash application which was created by Bill is the Cosmic Encounter Leaderboard which shows Cosmic Encounter player (and alien) ranking for any year, month, or day since the game launched in May of 2003, controlled by intelligent objects “talking” to Perl scripts (which are “talking” to the Cosmic database).